Things haven’t gone wholly to plan for Munster in recent seasons. After scaling the heights of European glory for the second time in 2008 and winning the Pro12 in 2010, they’ve somewhat drifted away from their heady heights. While never far off, they’ve somewhat slipped behind Leinster and even Munster in recent years, as some of the province’s finest servants have retired. 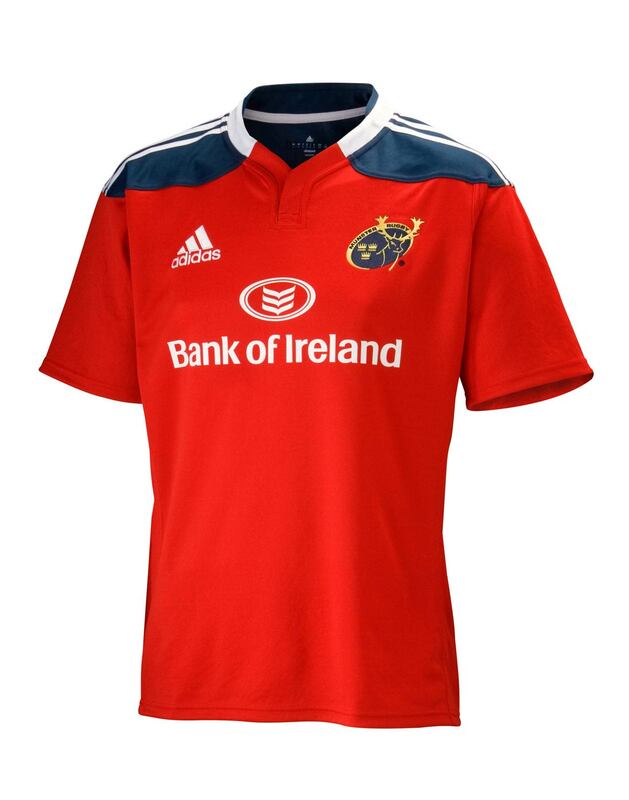 Whether Munster will be able to bring themselves back to their previous highs remains to be seen, but Adidas have always made sure they look good doing it. How does the 13/14 vintage fare? Let’s read on. 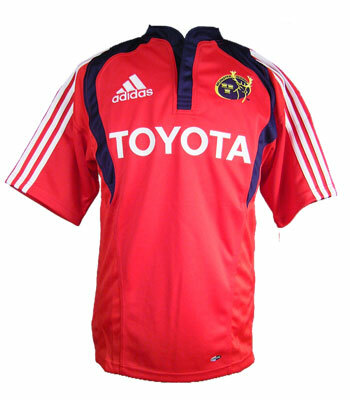 The 2012/13 Munster shirt was an exercise in restrained simplicity – plain red, with just a blue collar, it was a really understated classy design. It also saw the return of blue to the Munster shirt after a slightly ill-advised flirtation with white and gold back in 2011. The 2013/15 variant brings the blue back to even further prominence, in the most overt way since the Heineken Cup-winning 2008 shirt. But… it doesn’t quite work, does it? Last we heard, shoulder pads died a merciful death in about 1991, so quite why Adidas has decided to include a pair of whopping great blue shoulder pads here is beyond us. It doesn’t help that they’ve opted to make the Adidas stripes and collar white, either, giving this shirt a very messy, cluttered top line. 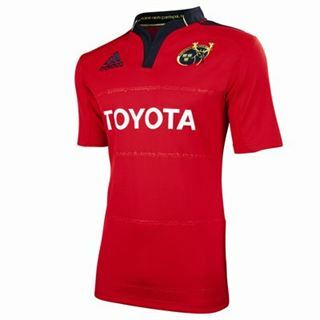 It’s no surprise that Adidas seems to have quickly abandoned this particular design motif – none of the 2014 Adidas Super Rugby designs have used this template, and it seems that the ‘Stripe Scarf’, which goes more around the back of the shoulders and less on the front, seems to have been favoured for Munster’s 2014/15 alternate shirt, as well as other 14/15 club designs. 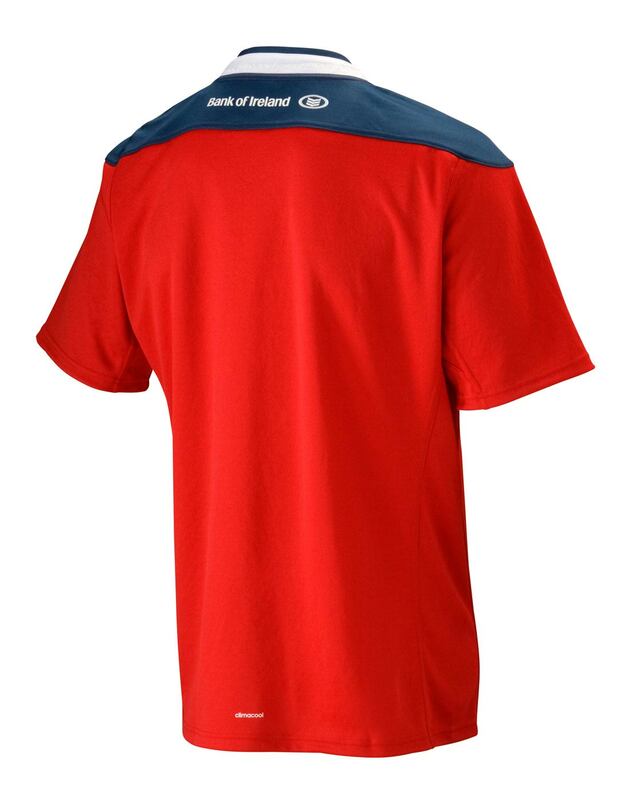 In fact, the only other shirt we’ve seen incorporate this weird shoulder pad design is the 14/15 Stade home shirt, which crucially, has stripes the same colour as the rest of the jersey. This is key, as it breaks the colour block up, and makes the whole thing look a lot less cluttered. Adidas haven’t missed too often with their shirt designs of late, but this one is a bit of a dog – the shoulder pads make the top-line of the shirt look far too busy, and cluttered, in a very mid-2000s kinda way. We appreciate that Munster fans might look back on those days with a lot of fondness, but kit design has definitely moved on since then. It’s a shame we’re going to have to look at this for two whole seasons.